The most important pieces of equipment you will use in sports is the badminton racket. According to your ability and style you can choose the better one. First of all you have to know about product and you should have product knowledge. While taking your decision, think about either you playing most powerful shots, or more with control and precision. 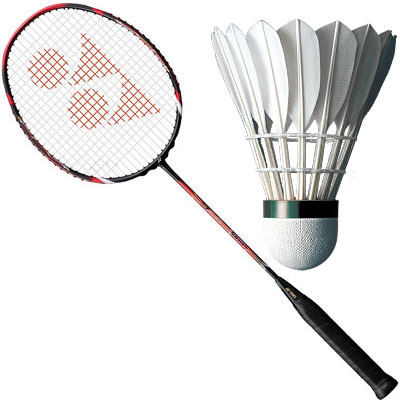 Both badminton racket and shuttlecock are essential for a badminton player. Every racquet has a different power and control which represents different features of rackets. To implements your needs you can choose the better racket according to your preference. We create three group into different players which is the beginner, the intermediate and the advance group. According to player we can design a table. When you see this table you can easily makes your decision. * How does weight differ between rackets, and what is suitable for me? WEIGHT : Each rackets has different weights with different product features. To determine the weight of the racket' head it is categorizes into three category which is heavy-head, balanced, or light-head. These three group are translate to offend, balanced, defense players . The normal weight of racket is upto 80-95g. The weight of racket determines how one can swing a racket faster. One can swing faster when racket is lighter. Generally, a lighter racket is more maneuverable than a heavy one. For an offensive player a head-heavy racket is required, and for a defensive one it is head-light racket. * What is racket balance, and what difference does it make? Racket balance is a very important features to maintaining its balance. It is the player personal preference which can you select. Balance is the final characteristics of the racket. The most popular racket is upcoming which is Head balanced racket. This racket is more stable and when it is swung it gives higher angular momentum. Head light rackets are easy to handle and maneuverable, this type of racket is needed for defensive player. * Are badminton rackets made in different grip sizes? * Which head shape suits me best? While buying racquet you must think about the racket head’s shape and weight. To determining the racket’s power and control these two aspects play important roles. There are two major head shapes which is Isometric and Oval. The most popular head' shape racket is isometric or square racket which is easily found. The features of isometric head racket is enlarged in size and sweet spot which give off-centered hit a better response. The oval-shaped head has a smaller in size and its sweet spot gives more concentrated while it hits the stocks. * Why is shaft flexibility important? A Racket's flexibility comes from the shaft, or the area between the handle and the strung area of the frame. When time is maximum, the more power you can give to shuttle through the badminton Racket. To generate good power, more strength and best technique should be used. In general, the shaft flex and the string tension are the two factors which control how long the shuttlecock makes physical contact with the Racket. Since it requires more power, a Racket that is too stiff can prove too difficult to use for someone with a small stature or who is only starting to learn how to play badminton. That enables you control the shot more accurately. For beginners flexible rackets are more suitable because you don't have to give extra power to play strong shots. Since less strength is needed. * What materials are rackets made from? Now a days racket is made up of carbon fiber and graphite composite. In rackets 99% graphite is mainly used. The racket’s frame is generally made from light weight metal such as graphite or aluminum. Lightweight rackets provides to find and hit fast-moving shuttlecocks which gives greater frame flexibility, durability and performance without compromising value for money. Lightweight rackets is the most manageable and maneuverable in nature. While making the string of a racket nylon is used and it gives strong and long lasting product which is cheap. Good string can change a lot of difference to your playing racket game. String is very important and essential part of the racquet. Good string gives more power in your technique when it is appropriately setup which give you good feel, more control.. To get more durability and improve the control of a racket high string tensions is used whereas to increase control players used thicker string, but many players prefer the feel of thinner strings because its gives more power. It is the only choice of player which one they prefer. String tension is varies from player to player. The table below will assist you in choosing the correct racket string tension.